Oldfield Wins the Battle, Holmes Wins the War! 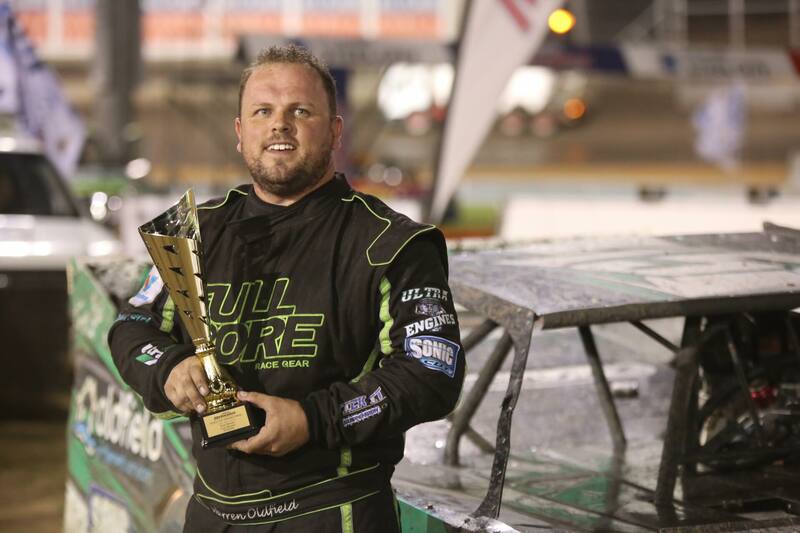 Warren Oldfield has tonight raced his way to his nineteenth feature win at the Perth Motorplex in what was the final round of the Sims Metal Management Late Model Pro Dirt Series, but it is Michael Holmes who has done enough to clinch the overall series championship after an epic battle throughout the season. Coming into the final feature race Holmes had taken over the series lead from Marc Giancola who headed infield during the first of two features held tonight and would then fail to start the second feature of the night. Tonight’s second feature, this time over thirty laps, would see Holmes and newly crowned WA Champion Brent Vosbergen on the front row, Vosbergen grabbing the lead early and racing away from second placed Holmes and Jay Cardy. Cardy would then go high and fly past Holmes for second, but Holmes quickly fought back and the two drew level just behind Vosbergen in what was shaping up to be a great battle. The yellows then came on shortly after for Jamie Oldfield who found himself stranded in turn three, seeing the field slow and bunch up once again. The restart saw Warren Oldfield the big winner, racing past both Holmes and Cardy to grab second place and then set out after Vosbergen who had broken away to a small lead. Oldfield closed the gap to 0.2 seconds on lap six, then he suddenly swept around the outside on lap seven to lead by 0.066 seconds. Just one lap later the yellows were out again though, this time for Joe Chalmers who came to a stop up against the turn two wall. Oldfield led away the restart, with Holmes on the outside but Vosbergen able to dive underneath and retake second place. Ryan Halliday was also on the scene at this point, looking to follow Vosbergen through under Holmes but Holmes soon moved to the bottom, stopping Halliday’s run. Brad Blake then moved past Cardy to take over fifth place and he began to look for a way past Halliday, the top six of Oldfield, Vosbergen, Holmes, Halliday, Blake and Cardy in a neat line ahead of the rest of the field. Oldfield methodically wound down the lap counter, holding his line and maintaining his lead, even when he encountered lapped traffic at the halfway point of the race. Behind him Holmes had closed on Vosbergen and was looking high and low for a way through, but unable to make any moves stick while Cardy was eventually able to make a move on Brad Blake for fifth. In the end though Oldfield was never headed, going on to record his nineteenth feature win at the Perth Motorplex and in the process making it the eighth year in a row that he has claimed a feature win at the venue. Vosbergen was a strong second while Holmes held on for third which was enough to clinch both the Perth Motorplex Track Championship and the Sims Metal Management Pro Dirt Series. 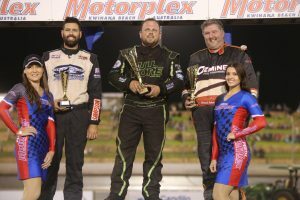 Brad Blake moved into second place overall in the Sims Metal Series courtesy of his results tonight while Jay Cardy also worked his way into third after the demise of Giancola. It has been a huge season, so stay tuned in the coming weeks as we do a complete wrap up, share some stats and of course enjoy our end of season presentation night! Qualifying, 2 laps: 1. 43 Marc Giancola 15.718, 2. 4 Brent Vosbergen 15.837, 3. 0 Brad Blake 15.935, 4. 91 Michael Holmes 15.963, 5. 15 Warren Oldfield 15.995, 6. 50 Veronica McCann 16.171, 7. 51 Jamie Oldfield 16.174, 8. 52 Jay Cardy 16.388, 9. 99 Ryan Halliday 16.392, 10. 83 Daniel Ameduri 16.487, 11. 95 Jason Bond 16.506, 12. 71 Jamie Moon 16.545 , 13. 31 Paul Stubber 16.550, 14. 26 Ken Macpherson 16.638, 15. 60 Jayden Meckenstock 16.993, 16. 23 Joe Chalmers 17.172, 17. 12 Aydan Trewern 17.457, 18. 318 Freddy Kinsella 18.307, 19. 10 Cody Avins 18.674, 20. 117 Willy Powell 18.864, 21. 19 Simon McNab NTT, 22. 91w Graham Murray. Heat One, 8 laps: 1. 99 Ryan Halliday, 2. 15 Warren Oldfield, 3. 43 Marc Giancola, 4. 0 Brad Blake, 5. 51 Jamie Oldfield, 6. 31 Paul Stubber, 7. 95 Jason Bond, 8. 60 Jayden Meckenstock, 9. 12 Aydan Trewern, 10. 19 Simon McNab, 11. 10 Cody Avins. Total Time: 2.10.864. Winning Margin: 1.378. Fastest Lap: 15.984 Ryan Halliday. Heat Two, 8 laps: 1. 91 Michael Holmes, 2. 4 Brent Vosbergen, 3. 52 Jay Cardy, 4. 71 Jamie Moon, 5. 26 Ken Macpherson, 6. 50 Veronica McCann, 7. 318 Freddy Kinsella, 8. 83 Daniel Ameduri, 9. 23 Joe Chalmers, 10. 117 Willy Powell. DNF: 91w Graham Murray. Total Time: No Time. Winning Margin: 2.072. Fastest Lap: 15.989 Michael Holmes. Round 7 Feature, 20 laps: 1. 91 Michael Holmes, 2. 0 Brad Blake, 3. 99 Ryan Halliday, 4. 4 Brent Vosbergen, 5. 15 Warren Oldfield, 6. 52 Jay Cardy, 7. 51 Jamie Oldfield, 8. 26 Ken Macpherson (19), 9. 83 Daniel Ameduri (19), 10. 23 Joe Chalmers (19), 11. 71 Jamie Moon (19), 12. 60 Jayden Meckenstock (19), 13. 12 Aydan Trewern (19), 14. 117 Willy Powell (19). DNF: 43 Marc Giancola (17), 50 Veronica McCann (2), 19 Simon McNab (0), 31 Paul Stubber (0), 318 Freddy Kinsella (0), 95 Jason Bond (0), 10 Cody Avins (0). DNS: 91w Graham Murray, USA14G Joe Godsey, USA14 Jeff Roth, 41 Kye Blight, 75 Mick Comley, 84 Chris Pavlovich. Total Time: 5.32.957. Winning Margin: 7.429. Fastest Lap: 15.897 Michael Holmes. Round 12 Feature, 30 laps: 1. 15 Warren Oldfield, 2. 4 Brent Vosbergen, 3. 91 Michael Holmes, 4. 99 Ryan Halliday, 5. 52 Jay Cardy, 6. 0 Brad Blake, 7. 83 Daniel Ameduri, (29) 8. 12 Aydan Trewern (29), 9. 71 Jamie Moon (29), 10. 117 Willy Powell (28), 11. 318 Freddy Kinsella (28). DNF: 23 Joe Chalmers (7), 51 Jamie Oldfield (4), 19 Simon McNab (1), 26 Ken Macpherson (1), 50 Veronica McCann (1). DNS: 10 Cody Avins, 31 Paul Stubber, 43 Marc Giancola, 60 Jayden Meckenstock, 91w Graham Murray, 95 Jason Bond. Total Time: No Time. Winning Margin: 5.683. Fastest Lap: 16.270 Warren Oldfield.